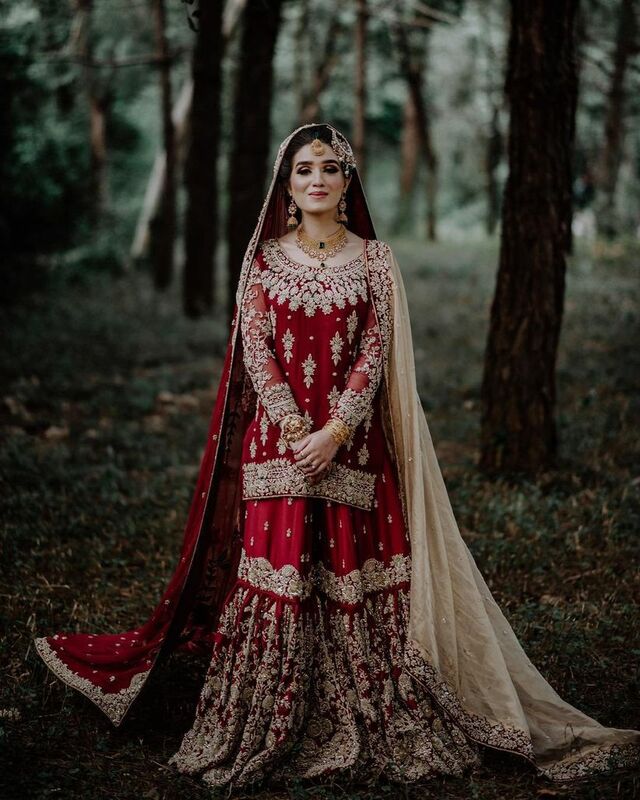 8 Gorgeous Brides and Their Pakistani Wedding Dresses That Are Giving Us Major Fashion Goals | Wedding Tips ARE YOU A VENDOR? 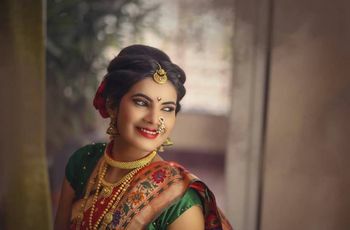 If you thought that only Indian brides knew how to nail their wedding fashion looks, then you are in for a pleasant surprise. Let's look at some Pakistani wedding dresses which serve as a proof to this fact. Count on your fingers and tell us the number of times you have swooned or happily sighed after looking at a gorgeous bride, in person or otherwise. We can bet that most of you have lost count of how many times you have done that. Well, it’s not just you. Brides in all their finery tend to have that effect on people. But if you thought that only Indian brides can elicit that reaction, then you are in for a pleasant surprise. Seems like our next-door neighbours, the gorgeous Pakistani brides have a great taste in wedding dresses too. 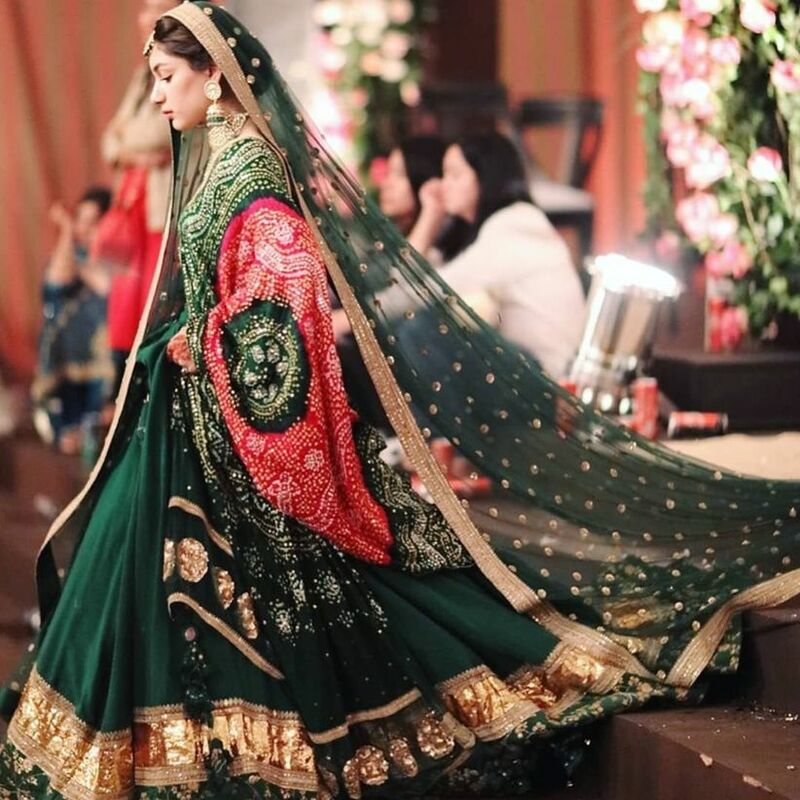 Here are 8 gorgeous brides in their Pakistani wedding dresses that will give you major fashion goals. More than the stunning bride and the gorgeous colour combination of this Sabyasachi lehenga, what we love about this outfit is its freshness. The bride opted for this lehenga for her Mehndi ceremony and paired it with a Kundan choker and Jhumkas. We really loved the golden sequin detailing at the borders and the embellished Dupatta. What a vision to behold! 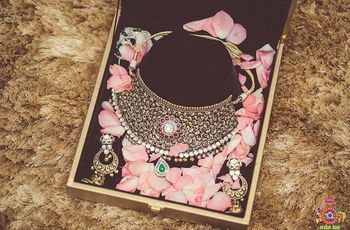 Although you might want to steer clear of any heavy and difficult-to-manage outfits for your Mehndi ceremony, we still think this one is a total winner. Now, this is what we call a breath of fresh air. 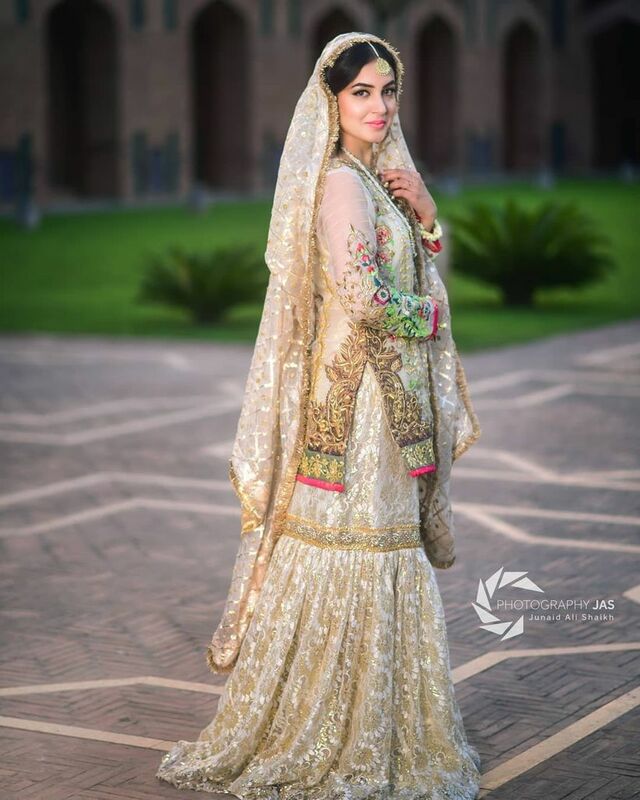 Most Pakistani brides opt for a Sharara for one or more of their wedding functions. 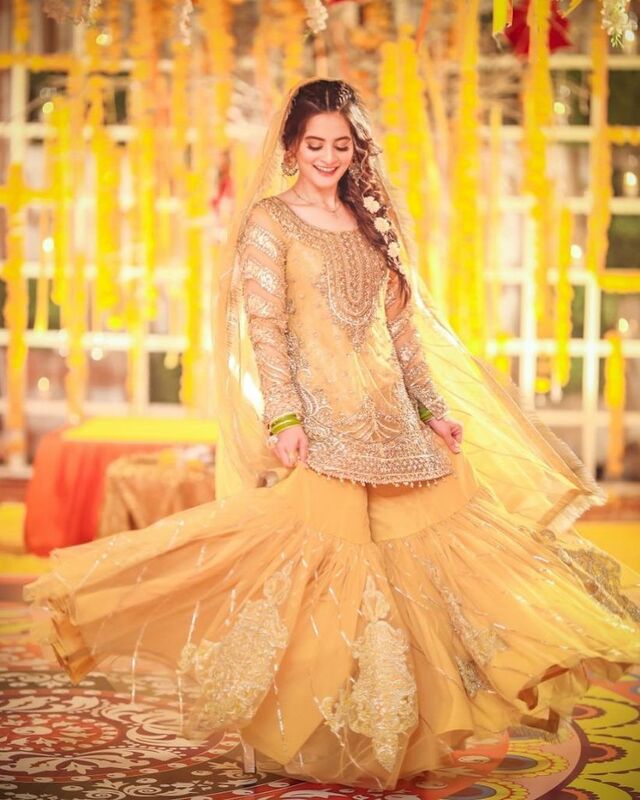 But famous Pakistani television actress Aiman Khan took her Sharara game a notch higher with this sunny yellow outfit with intricate Gota Patti work. You can wear this for your Mehndi or Haldi function, basically any event being held during the daytime. Avoid accessories with an outfit like this because they will only take away the focus from the dress and you don’t want that now, do you? We couldn’t resist picking another one of Aiman’s looks for this list because just look how pretty! 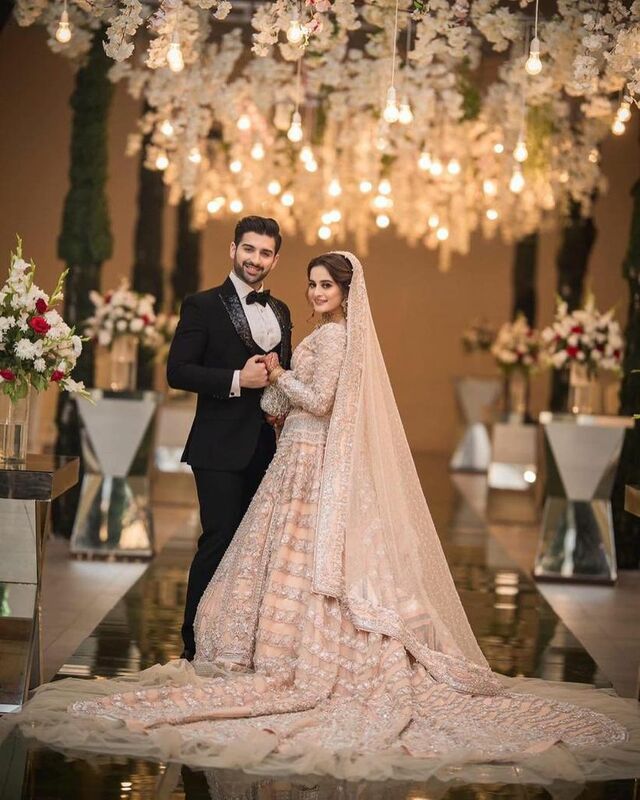 Aiman looked like a princess in this pale-pink heavily embellished outfit at her Walima. 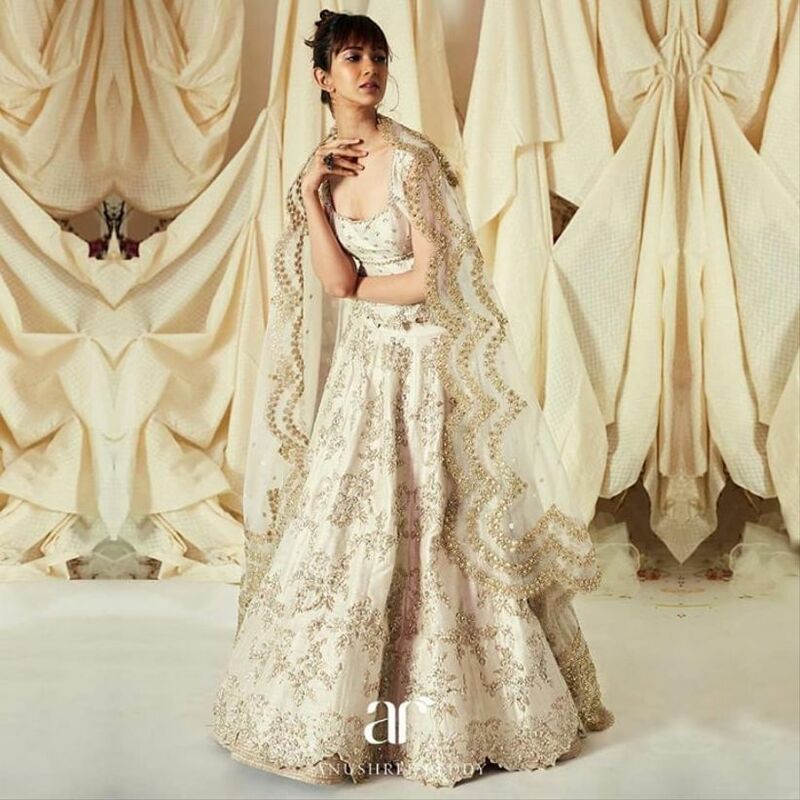 But apart from all else, what really caught our attention first was the regally long train of her lehenga skirt and the net detailing at the hem. This is what love at first sight looks like, ladies! There is nothing as pure as a mother’s love and blessings for a daughter, and thus we think it’s a great idea to wear your mother’s wedding outfit for one of your wedding functions. 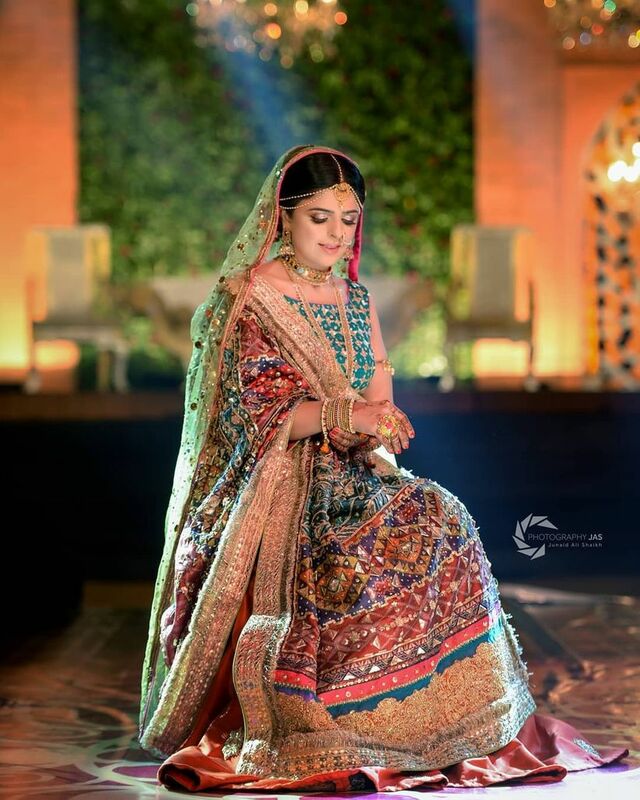 This beautiful bride revamped her mother’s wedding lehenga a bit and wore it for her Sangeet. There is an old world charm about the Gota and Zari work that is hard to miss. We are also totally loving the Chaandbali with pearl chains that the bride has accessorised her look with. They complement her outfit completely and make her look like a stunning bride. Red was, is and will always be THE colour of weddings for us and our neighbours seem to agree with us on this one as can be seen in Pakistani wedding dresses. This bride looks like all things royal in her heavily embellished maroon and cream Sharara. The Passa and Maang Tikka go perfectly with it, but we would suggest you to go a little easy on jewellery if your outfit is heavy as it is. Minimal accessories are the key to nail this look. Nothing exuberates royalty and grandeur as beautifully as a silk outfit and this bride in a grey silk Anarkali is proof of this. Not only is her outfit giving us major fashion goals, but the fact that she opted for two Dupattas with it is just the cherry on top. When opting for a light-coloured ensemble for your wedding, you can do what this bride did and add a second Dupatta for a dash of colour. A Maang Tikka and Passa will go perfectly with this look. If you are someone who is finding it difficult to pick a particular colour for your wedding outfit, then do what this bride did and mix and match. Just make sure the colour combinations that you opt for don’t look over-the-top or bizarre when put together, and you are good to go. Again, when opting for a super colourful outfit, pick your jewellery very carefully. A simple Matha Patti like the one worn by this bride and a choker with Jhumkas should do the trick. We saved the best one for the last. There is something so elegant and charming about this bride, that we just cannot take our eyes off her. Whether it is her beautiful white and gold Sharara or it’s just her bridal glow, we don’t know. But we are in love with her embroidered and embellished ensemble. It is pretty unique. If opting for a look as refreshing as this one, make sure you keep your makeup and jewellery light and simple. Also, a colour like this one would only be suitable for a day function, so keep that in mind too. While all these gorgeous brides were unique in their own way and their wedding dresses were quite different from each other, there is one thing that was common among all of them – their elegance, gracefulness and charm. 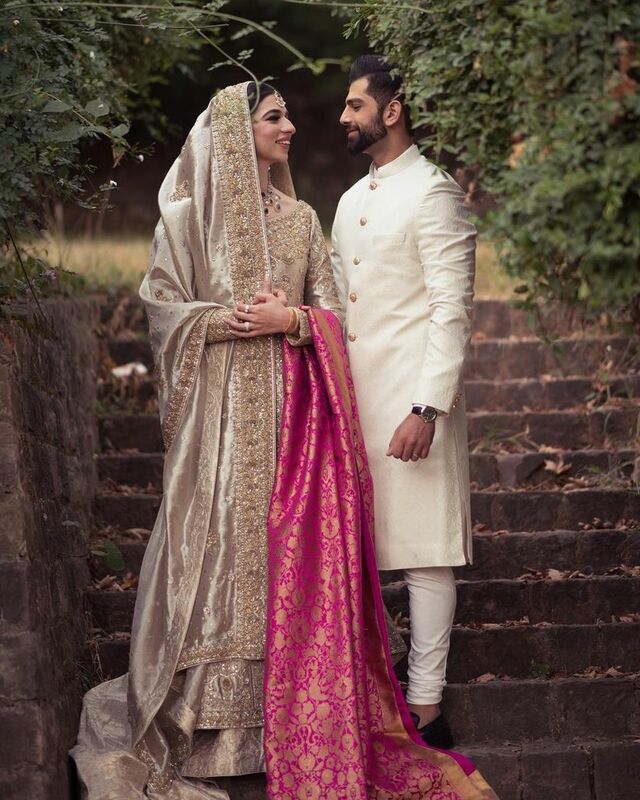 This is why we think that Pakistani brides and their wedding dresses are perfect bridal fashion inspirations. 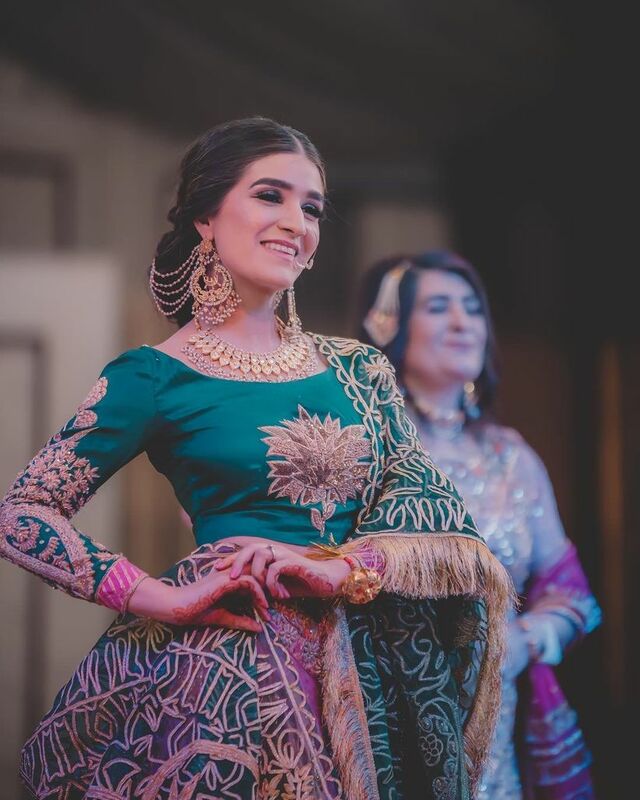 We are completely smitten by these stunning Pakistani wedding dresses and oh, of course, these beautiful brides. Tell us which one of these Pakistani wedding dresses is your favourite in the comment section below.